What is the meaning of Liberty? 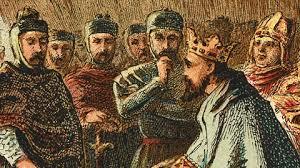 Why should a King operate within the Law? As a class or groups conduct a survey of students in the school asking what rules should be in place for the whole school and what rights the members of the school community should be entitled to. Once the survey has been conducted groups should create their own "Great Charter" that could be presented to the Principal for signing on the 800th Anniversary of the Magna Carta on the 15th June 2015. This lesson explores why laws are made that may be interpreted as controlling an individual’s freedom to choose how to act. Students will consider the law and who it is protecting and how the choices of an individual can have far reaching effects on the community, resources and family. Why do laws need to pass through both houses of parliament to gain approval? Why do we have laws? Why are they important in a democratic society? How do laws improve the society in which we live? Watch the Yaba video “The Flip Side of Bike Helmet Laws”. In groups students make a chart of WHO the law benefits (Individuals, Families, emergency service people)? WHAT resources are impacted (eg: medical, emergency services, long term carers)? WHY the law is necessary/unnecessary. Students develop a response to the video by drafting and going through the process of editing a persuasive text giving both facts and their opinion about either the subject of Bike Helmet Legislation or the reason why the making of laws such as Bike Helmets are an important part of Democratic process. If you would like your students to be part of the Yaba forum please contact jdoyle@cefa.org.au to register your class. Well written responses can then be published on the Yaba channel by the student for the Yaba community to discuss further. Students individually give the video a “thumbs up” if they liked the video.